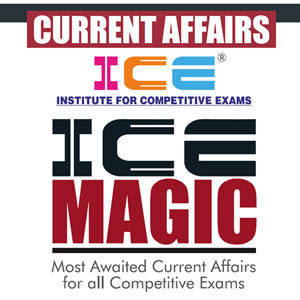 ICE Magic Weekly Current Affairs for All Competitive Exams. This Current Affairs is Published by Institute For Competitive Exams (ICE), Rajkot on Every Week. As Current Affairs is an Important Part of General Awareness Section of Every Competitive Exam. ICE Magic Weekly Current Affairs Usefull for All Competitive Exam Like... GPSC, UPSC, SSC, GSSSB, GPSSB, RRB, TET, TAT, HTAT, IAS, PSI, Bank, Railway, Police, Talati, Mamlatdar, Clerk, Deputy Chitnish and Many Other Competitive Exams.